A self-described carefree kid, Gilberto Gonzalez started out on the traditional path of an 18-year-old as a college freshman in the fall of 2000. 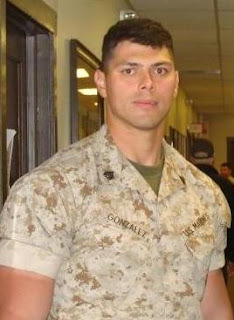 He soon decided to enlist in the Marines, with plans to complete summer boot camp and then resume classes in the fall. That was the summer of 2001, and Gilberto’s plans to balance school with service changed quickly when the Twin Towers fell. For the time being, it was going to be all service. Gilberto immediately shipped off to infantry school in North Carolina where he spent the year training before being deployed to Iraq. From 2001 to 2009, he got to see the world. Gilberto completed two tours of duty in a combat zone and spent time in nine different countries, including trips to Japan, Norway, Mongolia, and Kosovo. In those years, Gilberto underwent a transformation -- from naive college freshman to Marine and veteran. After his time in the Marines, Gilberto wanted to attend a school where he could do his work and get the job done, somewhere with an environment geared more towards working adult learners. He found that environment at Peirce, where he is surrounded by classmates who have a similar sense of purpose. This has undoubtedly been a transition for Gilberto. The friendliness and open doors of Peirce are quite the adjustment from the intensity of the Marines. Keeping a strict schedule and completing tasks is easy, but he admits that getting back into the routine of homework and writing papers is a whole new ball game. The guidance from Peirce’s Program Advising Center has been helpful in making this transition from Marine to student. Currently pursuing his bachelor’s degree in Business Administration with plans to graduate by spring of 2012, Gilberto’s adviser has been there with him along the way, working with him to schedule appropriate classes and making sure he is doing what’s necessary to graduate, which gives him peace of mind. Gilberto also enjoys the online services, where he can access the library and monitor his grades and homework assignments. Gilberto’s only regret is taking a year off after his last deployment. For those coming back from deployment, he believes it is important to start your life right where you left off. He also advises other veterans to take advantage of the GI Bill and other tuition resources for military members, which gives him the financial support he needs for his education at Peirce. Today, Gilberto is still in the Reserves and living in New Jersey where he has a strong support system of friends and family. Applying his military training to his college life, he understands the concept of coming up through the ranks, and plans to work his way up in the corporate world upon finishing school. The future is an open book for Gilberto. He sees himself pursuing a master’s degree someday and ultimately achieving success in the business world, but for now he’s taking it one step at a time. When is it time to move on to a new career?